Today, Hillary Clinton delivered the commencement address at her alma mater Wellesley, 48 years after she gave the first-ever student commencement address. And it was tremendous. You know, our culture often celebrates people who appear to go it alone. But the truth is that's not how life works. Anything worth doing takes a village. And you build that village by investing love and time into your relationships. And in those moments, for whatever reason, when it might feel bleak, think back to this place where women have the freedom to take risks, make mistakes, even fail in front of each other. Channel the strength of your Wellesley classmates and experiences. I guarantee you it will help you stand up a little straighter, feel a little braver, knowing that the things you joked about and even took for granted can be your secret weapons for your future. One of the things that gave me the most hope and joy after the election, when I really needed it, was meeting so many young people who told me that my defeat had not defeated them. And I'm going to devote a lot of my future to helping you make your mark in the world. I created a new organization called Onward Together to help recruit and train future leaders, organize for real and lasting change. The work never ends. When I graduated and made that speech, I did say, and some of you might have pictures from that day with this on it, the challenge now is to practice politics as the art of making what appears to be impossible possible. That was true then. It's truer today. I never could have imagined where I would have been 48 years later. Certainly never that I would have run for the presidency of the United States or seen progress for women in all walks of life over the course of my lifetime. And yes, put millions of more cracks in that highest and hardest glass ceiling. Because just in those years, doors that once seemed sealed to women are now open. They're ready for you to walk through or charge through. To advance the struggle for equality, justice, and freedom. So whatever your dreams today, dream even bigger. Wherever you have set your sights, raise them even higher. And above all, keep going. Don't do it because I asked you to. Do it for yourselves. Do it for truth and reason. Do it because the history of Wellesley and this country tells us it's often during the darkest times when you can do the most good. Double down on your passions. Be bold. Try. Fail. Try again and lean on each other. Hold on to your values. Never give up on those dreams. I'm have been optimistic about the future. Because I think after we've tried a lot of other things, we get back to the business of America. I believe in you with all my heart. I want you to believe in yourselves. So go forth. Be great. Hillary Clinton is a leader for people who want to lead. She is a shatterer of glass ceilings. She is a blazer of trails. She is a dreamer of big dreams, and the inspiration for even bigger ones. Above all, Hillary Clinton is a builder of villages. She knows, and reminds us often, that it takes a village. She knows, too, that not everyone has the village they need—and so her life's work has been, and continues to be, finding ways to ensure that every person is part of a strong, supportive, sustainable village that can uplift its villagers to achieve their goals. And to imagine radical goals of otherwise improbable scope, which can only be conceived in the safety of spaces where opportunity and community make the impossible seem within reach. Clinton embodies the absolute inverse of the Republican Party's destructive instinct. Following days and weeks (and months and years) of the Republican Party proposing and enacting policy designed to destroy democratic institutions, communities, and people's very lives, it was an excruciatingly stark juxtaposition listening to Clinton speak about the things we can—and must—build. And promising to help us build them. Following Clinton's address, a number of Important People wondered: "Where was this Hillary Clinton during the election?" There is, perhaps, no more dishonest or self-serving musing anyone could make in response to that address, which was classic Clinton. It is a musing that is naught but rank victim-blaming and gaslighting. A rhetorical device meant to absolve oneself of having failed to see who she really is. She was right in front of our faces, all along. I spent the entirety of the campaign writing about "this Hillary Clinton," which was one of the great privileges and highlights of my professional life. She was there to behold, for anyone who was not busy instead being enchanted by Trump's empty podium or four decades of misogynist filth. "This Hillary Clinton," the one giving a sharp and stirring commencement address, was the same Hillary Clinton who has always stood before us, offering her service. The same gifted leader, the same master of policy, the same patriot who petitioned to lead this nation. The same builder of villages. I am incandescently angry at the people who made great efforts to not see "this Hillary Clinton" during the election. 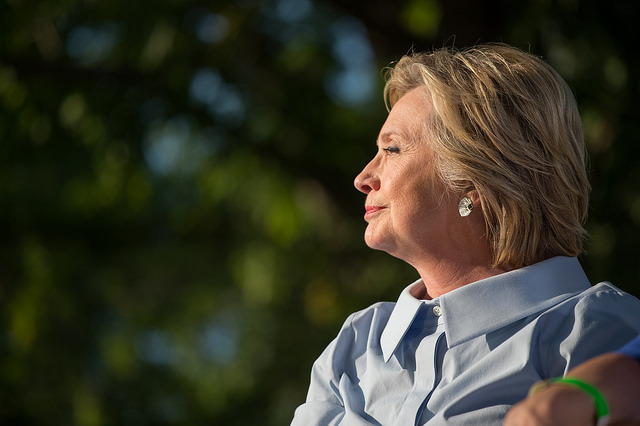 I will never get over her not being my president; we will lose so very much because she isn't—and I lay a significant portion of the blame at the feet of those who couldn't be bothered, or flatly refused, to see Clinton for who she is and has always been. And I almost—almost—feel sympathy for them, that they have denied themselves the opportunity to get to know and spend time with this extraordinary woman, and with the people who believe in her; the people who see her. Because it is a fine experience indeed to be a part of the village she's built.